MommaSaid | Have Your Kids Reached the Stupid Curve? Browse: Home / 2011 / February / 17 / Have Your Kids Reached the Stupid Curve? Have Your Kids Reached the Stupid Curve? I wrote this one for Good Housekeeping three years ago. Since then, we’ve managed to stay ahead of the Stupid Curve — most of the time. It was like a warning from the future. At a recent wedding, the father of a 20-something and a 19-year-old was telling me his theory about kids and the ridiculous things they sometimes do. He had witnessed the peak of his son’s Stupid Curve, where else, but on YouTube. His teenaged son had been filmed jumping off a 60-foot high rock into a reservoir. That’s like leaping from a six-story high building, or more than twice the height of the average house. Damn you, Spiderman*, for making it look so easy. The dad reported that his son’s friends churned up the water to lessen his blow. Better to break the surface than your feet. That’s smart thinking on the Stupid Curve. Amazingly, he was unharmed. Suddenly, I felt a little flush. I imagined my own sons teetering atop a rock – and then I pictured myself, back in my own Stupid Curve days. Only, my rock overlooking Lake George was about 20 feet high, and my best friend was warning me to “jump out first, or you’ll scrape your back on the rock all the way down.” Amazingly, we were unharmed. Soon, all my Stupid Curve activities flashed before my eyes. Fast cars. Frat houses. Fireworks. A toga in the streets of Boston – in February. I don’t want to go into the details as I’m highly Googlable, and my kids have just reached the start of their own Stupid Curves. Why provide them with the cheat sheet? A few days after the wedding, I witnessed how the Stupid Curve starts its upward ascent. A tween in the back of my moving car unbuckled his seat belt for the third – and last – time. Even though I’d warned him to stay buckled twice before. Even though he’d previously been in a car accident while unbuckled and, if it hadn’t been for his shoulders hitting the front seats, he would have flown through the windshield head first. I pulled the car over and refused to drive until he buckled himself back in. I haven’t heard from him since I dropped him off at his house. A week later, yet another child unbuckled his seatbelt in the back of my moving car. I hit the brakes, and asked him how it felt to slide off his seat. “That was fun!” he replied — not exactly the response I was going for. “Why did you take off your seat belt?” I asked. “We’re almost there,” he answered, as though this made perfect sense. “So, do all these cars around us know that you’re almost home, and therefore, shouldn’t hit us?” I asked. He didn’t answer. His brother scolded him until he re-buckled his seatbelt, and I brought them home. Since then, he’s been sure to buckle his belt in my mini-van, but I have no idea what he’s doing in other people’s cars. At my house, the Stupid Curve is also starting its ascent. 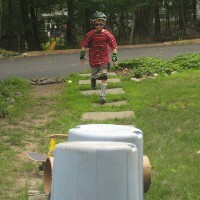 After watching the TV show “Wipeout,” with his grandparents, my nine-year-old decided to set up an obstacle course in our front yard involving a skateboard, a large cardboard tube, some plastic cones and two overturned garbage cans. “Mom! It’s just like ‘Wipeout’!” he shouted as he leaped over the cans. I noticed his helmet, kneepads and wrist guards, and sighed in relief. “Careful,” I warned. That Stupid Curve can be steep. *Clearly, this was written before “Spiderman: Turn Off the Dark” hit Broadway (and the stage floor, repeatedly). Share, share: Have your kids reached the Stupid Curve? If so, what have you thwarted — or witnessed too late? That explains a lot, both for my husband and I and our now-adult children, especially my son. I’m afraid I’ve got plenty of years before my kids (12 and 9) reach the Stupid Curve. Until then, they’re just ramping up! It’s astonishing the lack of common sense kids can have, and I must say although my teen years were very tame compared to most, I still did some stupid things that could have killed me. Most of us do survive the stupid years, but unfortunately too many do not. You only have to read one day’s worth of the “local news” paragraphs in the paper to remind yourself that accidents happen and they could happen to anyone. Shuddering now. Knocking on wood, too. I guess most of us do survive the stupid years or we wouldn’t be here reflecting on them. Is there some comfort in that?